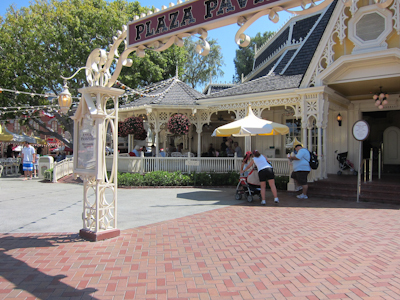 Today I’m going to talk to you about the Plaza Pavilion, which is the single most wasted space in the entire park. 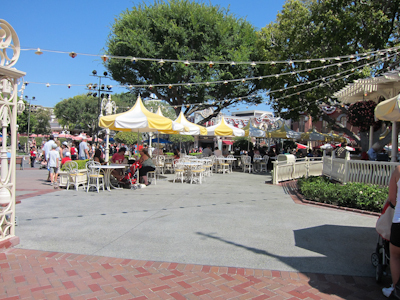 Now let’s face it–Disneyland does a pretty good job with its space. Sure, there are some major bottleneck areas (I’m looking at you, Adventureland throughway) and some not-so-well-planned viewing arrangements (like they showed Fantasmic for like 15 years before they realized it would be a good idea to come up with some kind of seating plan instead of a free-for-all wherever you were standing), but for the most part the space is well-used. Particularly given the amount of magic they cram into a property that is literally in the middle of a city. However, there is one sad building whose beautiful potential is completely wasted on its current purpose, and that is the Plaza Pavilion. And what is its current purpose? Yep, they’ve got this beautiful building in a fabulous location, right at the end of Main Street overlooking the hub, and all they do there is process annual passes. To get a better idea of the complete waste of space, look to your right. Or look to your left. I was always jealous of schools that had separate auditoriums. 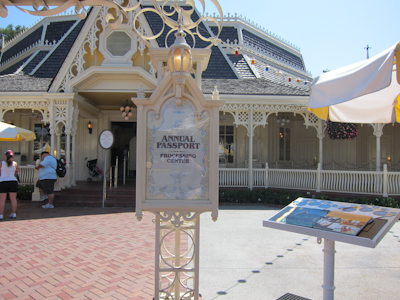 Anyway, outside of the Plaza Pavilion you have the one and only inside-the-park booth for the Disney Vacation Club. Now this is one major advantage Disneyland has over the Mouse-in-law: Disneyland only has one DVC booth in the entire park. (UPDATE: Reader correction–there are two! The other one is in Tomorrowland and apparently completely ignorable since I forgot about it )At the Mouse-in-law, there’s a DVC booth just about every 3 feet. I mean, in the entire resort there’s like one DVC booth for every 8 guests or something. And its little catchphrase is “Disney’s Best Kept Secret.” Which honestly, it’s not a secret if you can’t even walk a straight line without hitting a DVC booth. Stay tuned to this blog and I will tell you about Disneyland’s REAL best-kept secret. Later. Anyway, the DVC is a time share that you buy into where you can then go and stay at Disney properties. It’s a lot more popular in Florida than it is here. So if you want the DVC sales pitch, there is where you can get it inside of Disneyland. They wouldn’t let me go inside the annual pass processing center, since I wasn’t buying or renewing an annual pass, but here’s a picture of the doorway. And over on the side there’s some seating for The Restaurant That Can’t Decide What It Wants To Be Called. 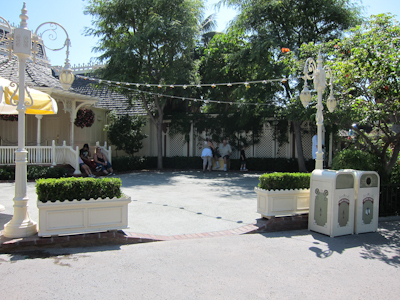 There have been a lot of rumors over the years as to what exactly Disneyland intends to do with the Plaza Pavilion. A rumor that sounds credible to me is that they are going to put annual pass processing over in CA Adventure (which I think is wise) and turn the Plaza Pavilion back into some kind of food-oriented venue. I heard speculation that it would be like a Mary Poppins-themed bakery, which I think would be really fun. But who knows. Please help those of us who do not live within commuting distance identify the Plaza Pavilion. All we know from you is that is is at the end of Main Street and faces the hub. 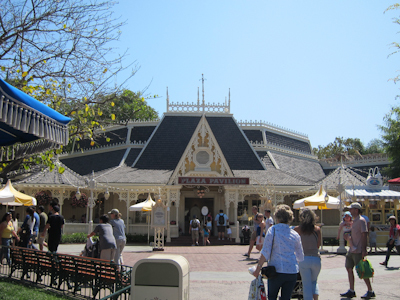 When I am walking up Main Street toward the Castle, on my left is Coke Corner and directly across the street (crossing the trolley tracks) is a small side street that holds the entrance to the first aid station. Where is the Plaza Pavilion in relation? I think you might be talking about a place that I used to use as a short cut to bypass the hub when getting to tomorrowland. I remember it being a food service area with tables and umbrellas Of course, they have since reconfigured that entire corner and moved the rocket jets to be directly on the hub, which eliminated the cut-through. Oops, sorry Linus! The PP is on the left side of Main Street facing the castle. It’s right after the Coke Corner and many use the extra tables for the CC. It’s sort of tucked behind, but it’s on the diagonal path to Adventureland. And it actually used to share a kitchen with Aladdin’s Oasis. Hope that helps! 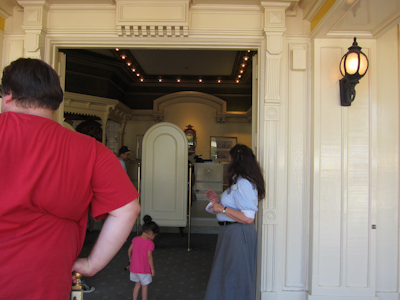 Actually Disneyland has three DVC kiosks. The one you point out. One (new!) in Tomorrowland, under a flying saucer, across from the Star Tours line. The last one is in Toon Town at the old Toon Town trolley stop. Wow. I have never realized that’s a lot of space until this blog post pointed it out. The processing center will close by the end of July. And I remember seeing a DVC cart by tomorrowland. oh dear god, puh-lease let it turn into a mary poppins bakery!!!!!!! I was also going to comment that there is a DVC cart in Tomorrowland. 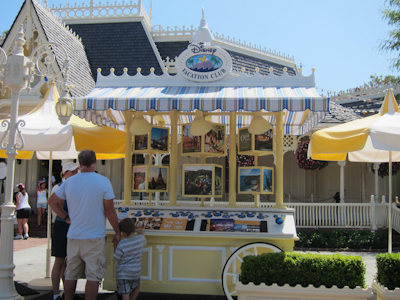 Interestingly, I never noticed the cart by the Pavilion, and I’ve only ever noticed one in DCA next to GRR. Funny, I thought that that building was a restaurant. Also, the rumor on Mouseplanet is that the Blue Ribon bakery is closing to make more room for Coke Corner. The bakery is supposed to be re-opening in the old passholder building. All passholder transactions are supposed to take place at the ticket booths within the next month or so. Yes! A Mary Poppins themed bakery would be wonderful. Especially since her and Bert hang out there anyway. Once when my nephew was 5 and enamored with Mary Poppins we saw her in the restaurant that can’t decide it’s name, by the piano singing and she sang to him. It was quite sweet.